1:34 Two of Ian's photos on here tonight. Haven't long been home from the cinema where my sister & I went to see Bohemian Rhapsody. A bit loud but a very good movie. W_A. 'Night Eage and Anne. I seem to have missed a birthday yesterday. Belated Birthday greetings, Arachnid! 2:24. A very slow, but Good, Morning to all. Good Morning Wow_Axel, Kathy, Tom, & Hal; nite-nite Anne,& Rage! Hope you see a bit of sun in your day! Hoping the California wildfires are under control soon. Stay safe, friends. I wonder when the Canberra Carillon was built? It looks like it's somewhere between Art Deco and Modern style. 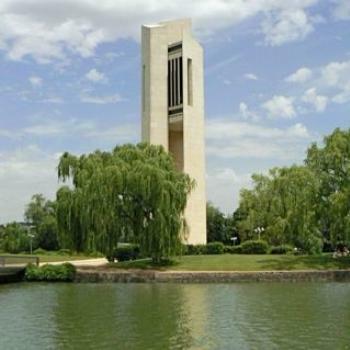 How lucky to live in Canberra & possibly have the joy of hearing that carillon played not only on holidays, but it appears as if it is played daily! Joyce! Shall we visit it on Christmas Day? Ian for the photo of the Carillon. There is a Carillon in Ottawa ,our Capital city. Morning all, I think another visit to Canberra is needed. Knew if I waited long enough Keith would get his number ! The Carillon is wonderful to listen to Joyce. I've often been running around Lake Burley Griffin while it's being played and have been there for a few recitals as well. Chris, I'm so envious! We have a small church at the end of our street which does not even have a steeple, but ever since we've lived here, they play recordings of carillon bells at noon, 5:00 & 8:00 pm - it is most delightful But surely the real thing would be magnificent! Kathy, I did sleep well. Friend of mine was digging three holes in his back yard, I asked him what he was doing? He said I'm burying my dog. I asked What the other two holes were for? He replied they weren't big enough.